Your Common Application ID is required to submit this form. Please submit this form after starting your Common Application to CMU Qatar. This form can be submitted before completing your Common Application, however, you must first receive your Common App ID (ID is provided immediately when starting the Common Application). 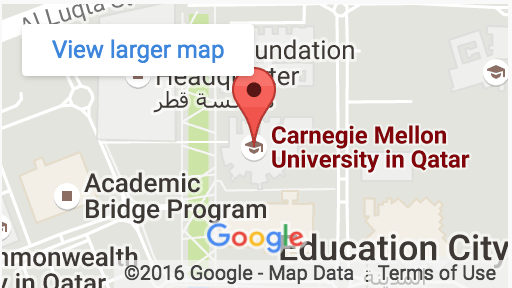 1) Carnegie Mellon University in Qatar must be your first choice university in order to apply for Early Decision. 2) Previous CMU Qatar outreach program participants (https://www.qatar.cmu.edu/future-students/workshops-events/) are given the unique privilege of being the only students eligible to apply for Early Decision at CMU Qatar for August 2019 entry. 3) In order to apply for Early Decision, the admitted student must be able to pay an Early Decision enrollment deposit by February 1st (deposit is approximately $1,000 USD). The only exception to the deposit requirement is granted to non-Qatari students who have applied for Qatar Foundation Financial Aid by December 31st AND are still waiting for their aid decision on Feb 1. The required enrollment deposit will be refunded to Qatari nationals in October 2019 (estimated date) once sponsor payment is made. For non-Qatari nationals, the enrollment deposit will be allocated toward the cost of attendance. Except for the case of sponsor payments for Qatari nationals, this enrollment deposit is non-refundable. 4) All students admitted through Early Decision are required to submit a mid-year school transcript/report from their current year of schooling, as well as their final results upon completing the school year. If the results from the mid-year report or final year report are not at the high level of academic performance under which the student was granted admission, it can be expected that the university will revoke the offer of admission. 5) You must agree to withdraw applications previously submitted to other institutions, in any country, when notified of Early Decision acceptance and financial aid decision from Qatar Foundation. Qatari nationals are required to immediately withdraw all applications from other universities, if admitted under Early Decision. Non-Qatari nationals are not able to compare financial aid packages between Carnegie Mellon University in Qatar and other universities you may have applied to. By checking the box, I am confirming that I have read the eligibility requirements and conditions for Early Decision at Carnegie Mellon University in Qatar, and I am stating that I am eligible for Early Decision at CMU Qatar. I agree to abide by the conditions and requirements set forth on this page.